I've told you before about RoadID, the emergency ID band for athletes. If you run or cycle or do any other solo sports in the outdoors, you should really consider getting yourself one. After the Dude showed his to a couple of cops at a hockey game (he wears his for sports, field trips and outings with large crowds), we listened to them tell stories about "finding people in ditches" - hit and run victims, people passed out from medical conditions, etc. It was chilling but it just goes to show that you never know what can happen to you when you head out alone for some exercise, and having a visible piece of ID on you can be hugely helpful for emergency crews to identify you and your medical conditions. And then I found this item on Yanko Design: I'm absolutely in love with this because I hate to carry anything with me when I run (other than tunes). 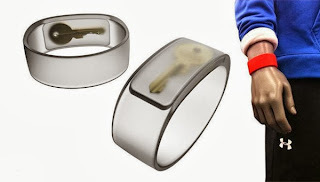 PocketBands is a thin silicone band with a secret pocket that you can use to store money or your house key. It comes in a variety of colours and patterns, and being silicone, is easy to keep clean and even waterproof. PocketBands was a successful KickStarter campaign and is currently sold out according to their website. So here's an idea: before the next production run, how about if RoadID and PocketBands get together to produce a hybrid product? RoadID has a silicone bracelet with an ID plate, and PocketBands is a silicone bracelet with a storage pocket... so how about an ID bracelet with a storage pocket? Wouldn't that be incredibly handy? So, how about it PocketBands and RoadID? Time to get together! Don't you think that's a match made in sports heaven?